I'm feeling a bit sick and I decided to stay home until I get better, so it's the perfect time to write a new post! I want to show you two new pair of shoes I bought! 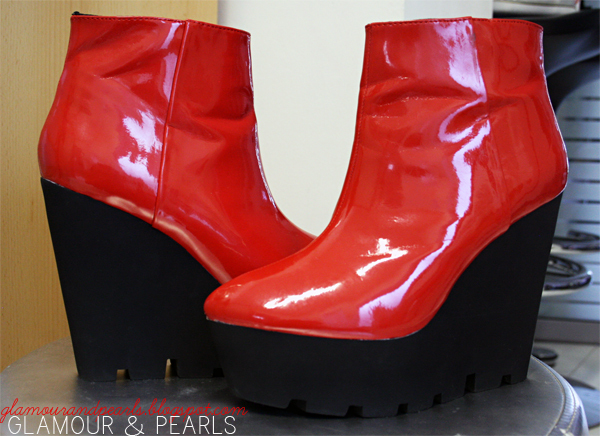 First up are these amazing shiny patent red wedges, which both my mom & I fell in love with the moment we spotted them! They also had it in 2 different colours, taupe & black suede, but the red just immediately caught our attention, and of course we chose to buy this one after all! Then there are these gorgeous crystal embellished boots, which I adore so much, I just want to wear them all the time! They are so girly & so pretty with all the shiny stones decorating them, and not to mention, they are also really comfortable! So when I'm having a bad day, or don't feel like wearing high heels at all, then these are definitely my choice of shoes for the day!